We are your Rail King headquarters, whether you’re in the market for new or used Rail King rail car movers. We also sell, service and customize Trackmobiles and Shuttlewagons. You’re going to love the new Rail King rail car mover models we have in stock. We offer both regular width cabs and full width cabs. 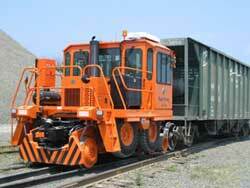 If you’re looking for a rental or used Trackmobile, Shuttlewagon or Rail King rail car mover, give us a call. Check back often to see a list of our used rail equipment units for sale. Remote control systems increase team efficiency for connection and disconnection of cars. We sell, install and service Control Chief Remote Control Systems for all makes of rail car movers, Rail King, Trackmobile and Shuttlewagon. Control systems can be installed in both new and used models. Shelby Railroad Service are experts in completely refurbishing your used Railcar Movers so they will run and look like new – whether its Rail King, Trackmobile, Shuttlewagon or any other rail equipment brand. Expect quick estimates on all repairs from cab repairs to engine and transmission rebuilding. Not only are we Rail King maintenance specialists, but we’re skilled in adding a large array of customized options to your rail equipment. Popular options are cold weather protection, snow blowers, battery disconnects, central lube system, fire extinguisher, air-ride seats, turn signals, spotlights, remote control, step extensions, 75-gallon fuel tank and 100 CFM air compressors. We offer much more – just call us or fill out our online form. We’d love to discuss new or used sales, repair, upgrade options or maintenance of Rail King rail car movers, new and used Trackmobiles, Shuttlewagons etc. Just call us at 901-365-1068 or fill out our short form and we’ll get back to you!